I only had a day, but this tour made the most of it. I had a great time and youll have plenty of time to explore on your own as well. Machu Picchu was great, and the guide was informative. But the guide only met us at the train. No guide or explanation on the bus to the train. Plus we were sent on the bus to Agua Calientes and told to enter Machu Picchu on our own, then come back out to meet the guide in an hour. The bus from Cusco to the train was freezing. We took a tour to Sacred Valley where there was a guide from hotel pickup to return and explanations of what to expect. The tour operator for Machu Picchu was different and very disappointing. Awful trip planning left us with only 2.5 hours at Machu Pichu. Tour guide was an hour and half late. The didn't have room for us on the bus back and we had to wait another hour and half to depart train station. Tour guide was difficult to schedule a meet up in Cusco and interfered with our plans. There was ZERO communication with me on planning the trip and booking. Originally they booked us on the lower class train and I had to call and have it changed to what I paid for. Would not recommend. The trip was great!! The tour manager in Cusco came to our hotel and explained what would happen the following morning. The train ride up to Agua Caliente was gorgeous. We were fortunate to get a wonderful sunny and warm day. The ruins were fantastic. The tour guide was very knowledgeable and showed up all the important highlights. There were only 9 people in our group so that made it easy to ask questions. The only worrisome part of the trip was trying to find the bus to take us back to Cusco. We were sweating bullets for a while. No bus in sight. We had to walk all over the town looking for the correct bus. The bus company needed better signage telling us where the bus would be. It tooks 5.5 hours each way from Cusco to stay there 5 hours only. The level of English of the guide was poor and he was not enough informative from my point of view. 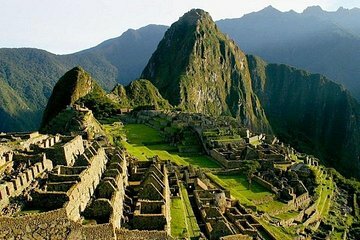 Machu Picchu is amazing, but if it is not well explained, it is hard to understand Inca's way of life. Finally, the last transfer didn't show up at the expected time, so I had to call the agency and wait for it for about 45 minutes. 0430 pick up on time. Some 40 minutes later we left Cusco. Without explanation friends and/or Staff were picked up and dropped off in addition to genuine customers. The driver then sought to make up the time by fast and erratic driving even by the standards of Peru. Cursory hand over at train station. Train journey excellent both ways,particularly the Staff fashion show and interaction on the return. Handover and admin entry tickets etc all very efficient. Guide was average at best,with superficial knowledge of English and seemingly the history of the sight. It seemed at times he was reading from a script. Machu Picchu of course extraordinary,best appreciated in our case at a slower pace after the frenetic guide had left us. Return journey from train to Cuzco much better with a competent driver arriving after 7.00 pm. All in all, a well organised if very long day. The tour guide was late the evening before to handle my tickets out. I called him many times and couldnt reach him. I called Viator to help me find the tour guide in order to receive my tickets on time. They couldnt help. It cost me like 180 USD, which Viator was very nice to pay for. The guide arrived late and didnt even say sorry. I guess they work like crazy since there are thousands of visitors daily. Early pick up, bus ride, nice Train ride with tea and Snacks, yet another bus ride. Spanish speaking tour guide, had to ask him to tell also sth in English. Little Information but thats the way it is... The freetime was nice in the shade-since it was beautiful sunny weather, and interact with llamas. Late Arrival back in Cusco. Amazing site, was really worth it. I guess ist just the touristic conditions, they have to stay dynamic to handle all the visitors. Ist defenitely a disadvantage but just Focus on this real wonder of the world itself. I would definitely recommend this tour. Everything was well organized. Everyone was punctual. The train ride was amazing...entertainment, food, and the view! Going to Machu Picchu was overall an amazing experience. However...I would not purchase a tour like this again. I feel as if I wasted many hours of my day in the area that was totally unnecessary. Taking a 2 hour bus ride to a train station to wait another hour to take a 2 hour train ride to wait another hour to take a bus...tour Machu Picchu...then wait 5 hours to take a train for 2 more hours to take a bus 2 more hours. That's a CRAZY LONG DAY! I bit the bullet and opted to pay an additional 124 to take another train right back to Cusco. I could have done this by myself with much better scheduling and a far lesser cost. Didn't hear anything from the tour company until the night before -- which was alarming as we weren't sure what any of the logistics were going to be where and when do we meet? etc. until last minute. When we finally got up to the entrance, we had to wait for the company to wrangle someone up to do the tour guide for us. Then, the guide only did a short 45 minute walk-through when we had expected a lot longer. Would not recommend.